After last week's snowstorm, Sabrina made a snowman on our deck. I loved seeing her acting like a giddy kid again, given her cool teen existence. I noticed, however, that the snowman was missing an appendage: an iPhone attached to his hand. Just like Sabrina, who is on her phone a whole lot. Sometimes when I get concerned this I'll blurt, "You're on your phone all the time!" to which she'll respond "That's not true, it's not all the time!" And technically she's right, she's not on her phone when she showers or sleeps. Nor should I be using trigger phrases like "all the time." One solution we've come up with is that she now charges the phone downstairs while she's doing homework and overnight, so she's not tempted to use it under her covers until 2:00 a.m. Not that I know anyone who'd do that. While she was taking an afternoon nap, I decided to prank her. I found a branch in our yard that had a wishbone-like end. I attached it to the snowman and positioned her phone on the end of it. Ben seemed extremely puzzled by what I was doing. Max laughed, gleefully. When Sabrina woke up from her nap, I told her that I'd given her phone to someone else, and that she needed to see who. She cracked up when she saw it—mom points, earned! She told her friends. And then, of course, she took her phone back. 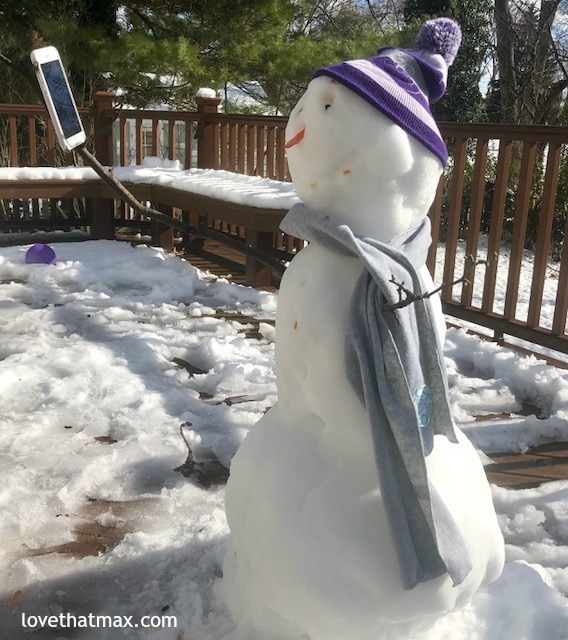 A few days later, the snowman was halfway melted, before I could try facetiming him with Sabrina or doing a Snapchat between them. Sabrina and I joked about him being sad about not having a phone, and it lead to a brief yet interesting discussion about phone usage. Me: "So, do you think you're on your phone a lot?" Sabrina: "But I'm not taking selfies to check my appearance." Me: "Oh, so what are you taking them for?" Sabrina: "To share them on Snapchat, so my friends can see! I like seeing all of theirs, too." This was somewhat reassuring to hear. Then she dashed off to do homework. Her phone stayed downstairs, within visible range of the snowman. I was tempted to give it back to him. I love the snowman selfie! Great idea!! My grandkids are 11, 7,6 and 4. The first thing they say when they walk in the door is “can I have your phone?” And the younger ones are actually worse than the 11 year old! But they sure are precious. I love that you charge phones downstairs at bedtime. That is something we want to do with our kids when they hit that age.